So if you still have tomato plants after the curly top virus hit many of our plants, congratulations! I had 84 tomato plants and am down to 48. Thankfully I planted more this year or I wouldn’t be at the Farmer’s Market. I’ve gotten many questions on why we don’t have many ripe tomatoes now. 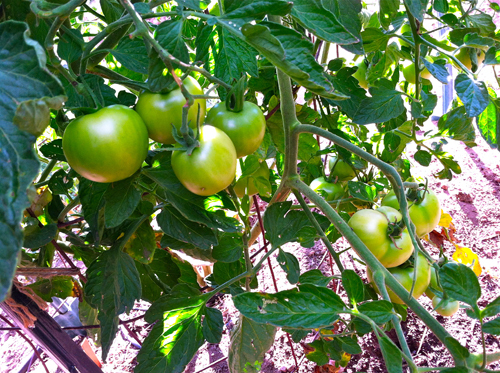 Lots of green ones, but few ripe ones and normally we would have LOTS of ripe tomatoes now. The reason is we had an unusually hot July with day temperatures over 90°F almost every day and the blossoms dropped back then, failing to set fruit. The number one reason for blossom drop is high temperatures over 90°F during the time blossoms would normally set in July (the number two reason is cold temperatures under 55°F). Once the temperatures dropped below 90°F in August they resumed setting tomatoes again hence the green tomatoes we are seeing now. So basically we are a month behind but should start seeing most of the tomatoes ripening. Ahh, the challenges of growing vegetables in the high deserts!